This was Asakura Haruka's singing event for minor idols. She invites some guests for this event, and sings and talks with them. I went to see Itou Asuka and two of the Maru Maru Gakuen Housoubu girls. It had been a few years since I went to Live Inn Magic. The ground floor part, which used to be a restaurant, is gone. Just the basement (stage and hall) is remaining. I arrived at around 19:45. Smoking was allowed in the hall, and there were a few smokers, so it was very smoky. There were five rows of six chairs, and there were two rows of long tables in the back. The crowd was about 20 people. The parts of the event that I saw was as follows. 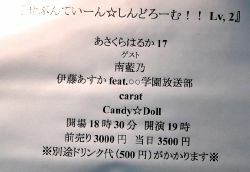 It seems each guest had a solo stage where they sang 3 or 4 songs. Then Asakura Haruka came onto the stage, and she talked with the guest for a few minutes. Itou Asuka's stage started around 21:00 and lasted for around 25 minutes. She came out by herself and sang a medley of three old idol songs. Then Asuka called Saori and Kanako (Nonchan) to the stage, and they sang three songs as a group. Asuka, Saori, and Kanako called themselves ASaNo as a group. A from Asuka, Sa from Saori, and No from Nonchan (Kanako's nickname). All three girls wore school girl-like outfits. The songs they sang as Asano were "Doukyuusei", "Asu he no Yuuki", and "Daisuki" (from Kira Kira Melody Gakuen). It seemed the volume on Saori's mike was very low. I couldn't hear her solo parts that much. Asakura Haruka also came out and sang the last part of "Daisuki", during and after the "hey hey" call parts. I brought my brand new 60D and EF70-200F2.8L lens, and my compact camera (Powershot S90). Photos without flash allowed of the stage (talk and songs). This was the first event where I used the 60D. Since my previous camera was the 20D, the 60D felt VERY nice! The AF is much better. The continuous shooting is faster, and the buffer got full only once. During Asuka and Asano's stage, I stood along the left wall (facing the stage) and took photos using a monopod. I ended up taking over 800 photos, with around 390 worth keeping.